The latest news and information from the Bermuda archaeological project being run by Ironbridge Archaeology and the Bermuda National Trust. 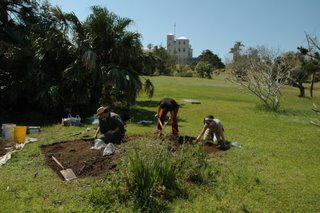 On Friday we conducted the first archaeological excavation to take place at Government House. 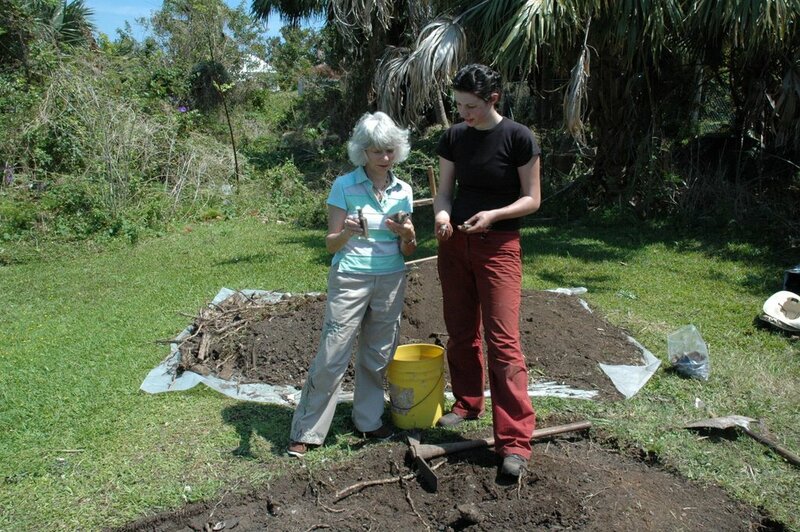 The Bermuda National Trust were invited by Lady Vereker to investigate the possible site of a midden in the grounds, which she discovered after trees were lost in Hurricane Fabian. Excavations in progress, with Govern- ment House behind. We excavated a trench approximately 4m x 2m in plan to evaluate the archaeological potential of the midden, centred around the bole of a screw palm where Lady Vereker has discovered some pottery. We were able to recover a wide range of pottery, glass and other artefacts (including some brass buttons) and a quantity of bone and shell. Most of the artefacts date from the later nineteenth century, so the midden is probably associated with the present Government House rather than its predecessor. 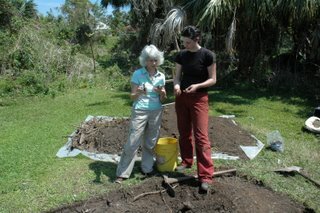 Katie showing Lady Vereker some of the artefacts from the dig. Ironbridge Archaeology is the archaeology unit of the Ironbridge Gorge Museum Trust. Established over 30 years ago, we specialise in historical archaeology and the archaeology of industrialisation. We are based in the Ironbridge Gorge World Heritage Site, but undertake commercial archaeological work throughout the whole country.